Mix together peanut butter, butter, vanilla, and confectioner’s sugar in large bowl. Place on parchment paper lined cookie sheet and freeze. Melt chocolate chips and shortening together in double-boiler. 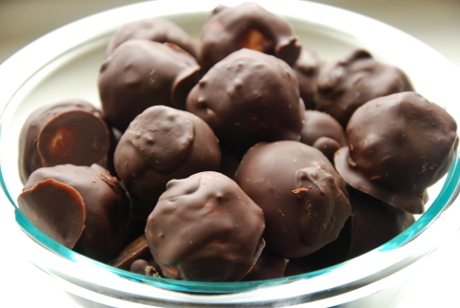 Dip frozen balls into chocolate using a toothpick, leaving a small circle at the top uncoated. Return to wax paper, small circle on top, and remove toothpick. After all are coated, dab chocolate on tops to cover completely.